Visitors to Llandudno cable car need to be on the brave side as it can get quite blowy and the cable cars are open to the elements. However, you won’t be disappointed. On one side, riders are treated to views of nearby Rhyl, the Isle of Man and across the Irish Sea. On the other, you’ll see Snowdonia like never before. The journey in the brightly coloured cars is over a mile, taking you to the summit of the Great Orme in about nine minutes. The ride has been largely unchanged since it opened in 1969 but don’t let that put you off! 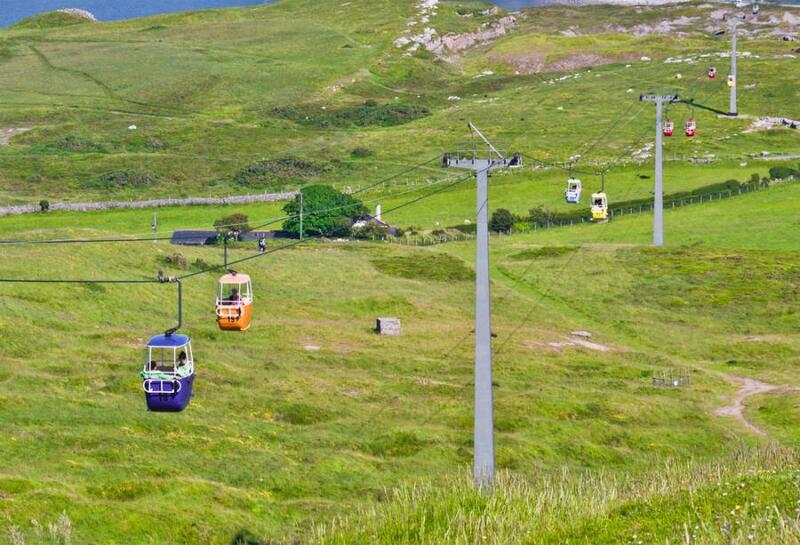 The Llandudno cable car is open between April and October, weather permitting. If it is stunning views and fresh, mountain air that you are after, then the Nevis Range mountain gondola system near Fort William is the ride for you! The gondolas take you up 2150ft on the north face of Aonach Mor, the eighth highest mountain in Britain (no, we can’t name all the higher ones either!). The journey, which takes between 12 and 15 minutes, provides visitors with stunning views of the Scottish Highlands including the Great Glen and Ben Nevis. If you’re really lucky and the clouds are on your side, you might even get a glimpse of the Inner Hebrides. The new kid on the block and swinging 90 metres up above the capital, the Emirates Air Line crosses the River Thames between Greenwich Peninsula and the Royal Docks. Allowing visitors the chance to see London from the air, including views of the iconic O2 and the looming towers of Canary Wharf, this is an excellent addition to the attractions list if you are visiting London. Flights are approximately 10 minutes each way and don’t worry if queuing is a pet-hate as cabins arrive every 30 seconds. You can even do this one at night time to get a totally different view of London by moonlight when the flight time is extended to a leisurely 25 minutes at no extra charge. This is a great one to do with friends or maybe to treat the special person in your life – very romantic! A massive family favourite in our house is the Needles chairlift on the Isle of Wight. Catch one of 50 chairs from the top of Alum Bay cliffs down on to the beach and you will be treated to spectacular views of the picturesque Needles Rocks and Lighthouse as well as the multi-coloured sand cliffs. If the weather is good then you might even forget you are in the UK when you catch sight of the twinkling turquoise seas! If you have a young child then they don’t have to miss out as the chairlift is open to anyone. However, it is not for the fainthearted as toddlers will be sat on your lap (which can be scary!) and babies need to be in a forward facing sling to enjoy the experience! Once you have skimmed some stones and had a paddle, you can catch a chairlift back up to the top or walk up instead (but be warned, it is quite a trek especially with children). Back at the top there are loads of fairground style activities to enjoy and even chance for an ice cream break! The Isle of Wight has so many awesome attractions but the chairlift down to Alum Beach is one of the best. In the heart of the Peak District, this is another gondola style cable car, set within the Heights of Abraham, which scales the heights of Masson Hill. The twelve cars, which are all enclosed, travel two thirds of a mile taking you 169 metres up and provide beautiful views of the Derwent Valley. 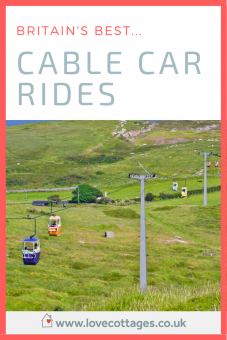 The cable cars run non-stop throughout the day and you can purchase tickets on the day with no need to book. With historical caverns to explore, any number of different walking routes to try out, several decent options for food and drink and two adventure playgrounds for the younger visitors, you can easily while away the hours at this Derbyshire tourist attraction. So it just goes to show that you don’t need to fly off to snow-capped mountains to take a trip into the clouds. Britain’s best cable car rides are pretty special too.